I have been with the Shipyard Girls since the very beginning and I really hope to be a part of their lives for many years to come. It is 1942 the war is still on and it seems such a long time since it started and there doesn’t seem to be any end in sight. These characters didn’t know that they were going to have to weather another 3 years. Polly one of the hardest working ‘Shipyard’ girls is left devastated when her Tommy goes missing, grief is breaking her heart and her heart is only going to be broken once. Everyone worries about Polly, when they can see she will only love the once. Helen, thought she was in love with Tommy at one time as well. In fact she probably is but when her affections are taken by Theo in the previous novel, the result reveals a testing time for Helen and her family. Her decision is going to change everything but when that decision is taking out of her hands, she turns to Gloria. Their forging friendship is very much a secret but when catastrophic events mean help comes from all over the place everyone gets to see a different side to Helen. Bel is still coming to terms with her parentage and the thread started in a previous book is wound through this one and certainly will feature I am sure in subsequent novels. Secrets cannot be kept forever, not when others are starting to see something familiar. Rosie is struggling with the right decision for her sister Charlotte, Sunderland is not necessarily the safest place to be. Lily and George have decided to get married at last. Kate the wonderful seamstress is thrilled to be designing and making the dress and she has an admirer as well. I could go on with snippets of all the comings and goings but there is no fun in that – you will need to catch up on everyone’s news yourself. All the characters I have got to know and love are all featured, as in any long running series, they are sometimes in the background and sometimes featured heavily in the storylines. Nancy Revell treats every one of them with care, love and respect and I cannot wait to continue my journey at the Shipyard and find out what else the war is going to throw at them as they try and survive. I heartily recommend this series of books. You could start with this one, but why deprive yourself of the previous five then you can completely immerse yourself in the Shipyard Girls and get to know them as well as I do. For me one of the best series of sagas around and without a doubt a simple joy to read the books when they are published. 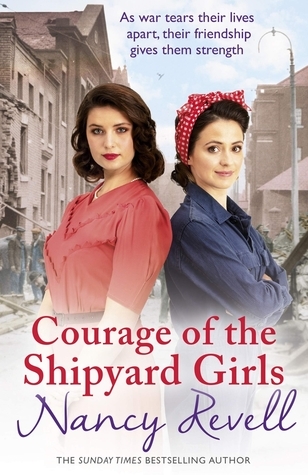 Courage of the Shipyard Girls is published on 21 February. Nancy Revell is the Sunday Times bestseller author of The Shipyard Girls series, which is set in the north-east of England during World War Two. Nancy is the pen name of Amanda Revell Walton, a former journalist who worked for all the national newspapers, providing them with hard-hitting news stories and in-depth features. She also wrote amazing and inspirational true life stories for just about every woman’s magazine in the country. When she first started writing The Shipyard Girls series, Nancy relocated back to her hometown of Sunderland, Tyne and Wear, along with her husband, Paul, and their English Bull Mastiff, Rosie. They now live just a short walk away from the beautiful award-winning beaches of Roker and Seaburn, within a mile of where the books are set. The Shipyard Girls is particularly close to Nancy’s heart as she comes from a long line of shipbuilders, who were well known in the area.